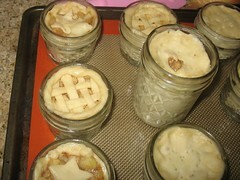 New Wave Domesticity: my love of mason jars continues...in pie form! so, you know how i made that post about how much i love mason jars? 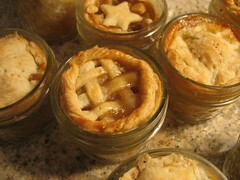 well, on my list of all the amazing things to do with mason jars, i had almost forgotten that i saw the post on not martha about these tiny jar pies about a year ago, but they had quickly fallen to the bottom of a busy to do list...and then a post from little birdie secrets reignited my obsession and i just had to make these! i had a bunch of 8oz jars and 4oz jars left over from summer jams, so this was a great way to put them to work. i found that the tiny 4oz jars were actually perfect for a cute little hand held portion of pie, but my boyfriend, bryan, thought they were too small to consider a portion...we can both agree a portion size depends on the person i suppose. making a good pie crust is not that difficult, but it can be time consuming and it is all about technique, i found this tutorial at smitten kitchen incredibly useful for this part! then, once you have your crust ready and it has had time to chill roll out the dough to about 1/4 inch or so. i found that there was not a really great technique to lining the jars, so you can just carefully grab a section and shove it in and just do some pressing along the sides. i made 3 different fillings just to try some things out. i made a really basic traditional pear and apple sweet pie filling. i also wanted to experiment with simple dinners, so i also made a really easy (aka lazy) vegatarian chicken potpie (which was basically some frozen mixed veggies, sauteed onion, faux chicken strips, cream of mushroom soup, and some rosemary and spices of your choice) which i plan to heat up again tonight for dinner. i would recommend not over filling them because even though they are tiny, they sure will bubble up, so next time i would make sure there is a bit of extra space for the filling to bubble up and move a bit without a volcanic erruption. i put them on a silpad to keep them from moving around when taking them out of the oven (i would say this is a pretty crutial step so you don't end up with an oven coated in pie filling) and baked them for about an hour at 400 degrees. the nice thing about little clear jars is that is it very easy to see when your pies are actually done when they reach that nice golden brown color, so just keep checking on them. the 8 oz ones took a bit longer than the 4oz jars. 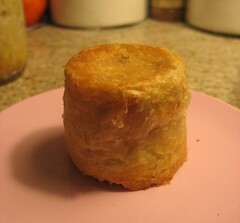 the wonderful thing about these is that you can keep them frozen and just take them out for homemade pie on demand. they also would make absolutely wondeful gifts either all baked up or frozen with instructions on baking. 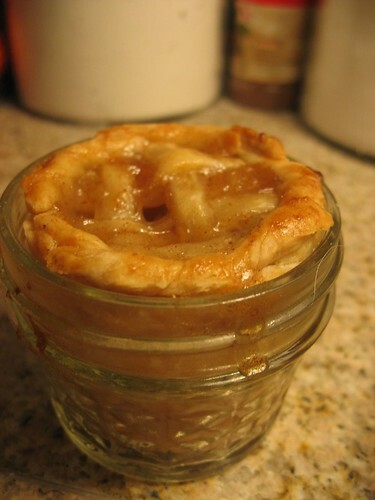 the pies are easy to pop out of the jar by just slipping a knife down the side and a bit of tapping, but i also think they would be just fine eaten right out of the jar! 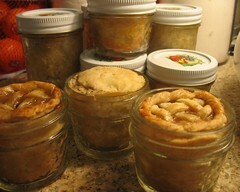 pie in jars is just the begining. i am now a bit addicted and cannot wait to try out little cupcakes in a jar or other fun desserts and things. 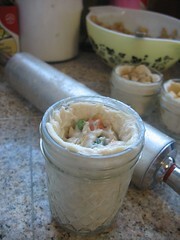 my world has been rocked a little by the idea of cooking in jars. yeah, i am that much of a nerd. 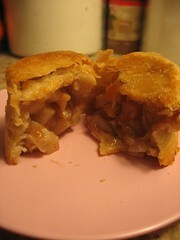 These are the cutest little pies ever!